A new satellite that will detect the lightning inside storm clouds may lead to valuable improvements in tornado detection. The GOES-R satellite is currently being built with new technology that may help provide earlier warnings for severe weather. 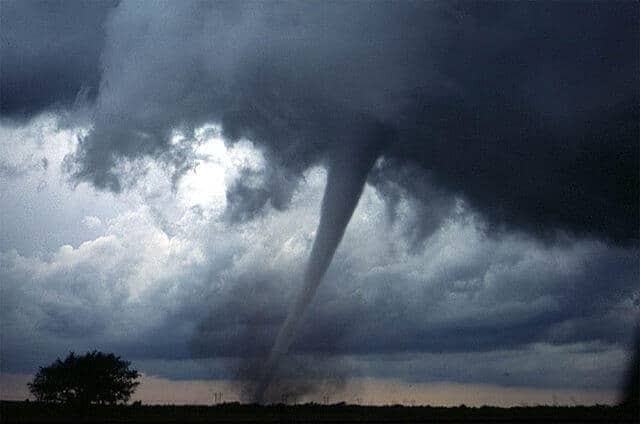 The national average is a 14-minute lead time to warn residents of a tornado, but NASA and NOAA scientists are looking to improve severe weather detection to save lives and property. They are developing the Geostationary Operational Environmental Satellite-R Series, or GOES-R, to observe thunderstorm development with much greater spatial and temporal detail than ever before. Severe weather knows no specific season and the new technology aboard GOES-R is expected to help provide earlier detection for warnings, whatever the time of year. On Jan. 29 and 30, 2013, a winter-time tornado outbreak produced multiple tornadoes from the southern Plains states, across the Mississippi River Valley, eastward to the Mid-Atlantic. On Feb. 10, several tornadoes touched down in Mississippi, destroying 200 homes, damaging and causing injuries near Hattiesburg. For the first time, scientists will be able to detect the lightning occurring inside storm clouds, and thus better track how developing storms are moving and intensifying before and during the occurrence of severe weather, Goodman said, all of which will help meteorologists better predict weather disasters. “Based on the GOES-R research, there is a potential for greater accuracy and additional tornado warning lead time,” Goodman said. One significant advancement could help detect developing tornadoes at night to provide the public more time to get to safety. Studies show that a sudden increase in total lightning flash rate is correlated to impending tornadoes and severe storms. The GOES-R Geostationary Lightning Mapper (GLM) will have a new capability to take continuous day and night measurements of the frequent intra-cloud lightning activity that accompanies many severe storms. This will help forecasters identify intensifying storms before they start producing severe weather on the ground, enabling the issuance of more timely and accurate severe weather warnings. The GLM instrument will see all types of lightning: cloud-to-ground, cloud-to-cloud and inside each cloud, and because the GOES-R satellite will cover most of the Western Hemisphere, it will help meteorologists track storms over the land and ocean from their inception. But lightning isn’t the only sign of an impending storm. Monitoring overshooting cloud tops can provide an early indication of a severe storm. These are dome-like clouds that penetrate above the anvil of a thunderstorm. The Advanced Baseline Imager (ABI) on GOES-R will better detect these overshooting tops that indicate a strong updraft. While the current GOES satellite imager usually provides updated weather conditions during the formation of a storm about every 15 or 30 minutes, ABI will be able to show the changing cloud and weather conditions every 30 seconds in rapid scan mode. When ABI is not monitoring the formation of a storm, it will send imagery over the United States every 5 minutes instead of every 15 minutes, greatly increasing the data available to weather forecasters. In addition to providing crucial information as part of NOAA’s fleet of operational weather satellites, GOES-R will also monitor space weather, such as solar flares and geomagnetic storms that stem from the sun’s activity and can affect spacecraft and human spaceflight. The Extreme Ultraviolet and X-ray Irradiance Sensors (EXIS) will detect solar flares that can disrupt communication, power grids and have effects on satellites and airline passengers. The Solar Ultraviolet Imager (SUVI) is a telescope that observes the sun to detect eruptions which may result in coronal mass ejections. And to assess radiation hazard to astronauts and satellites, the Space Environment In-Situ Suite (SEISS) will monitor protons, electrons and heavy ion fluxes at geosynchronous orbit. GOES-R’s Magnetometer (MAG) will also measure the magnetic field in space. NOAA manages the GOES-R Program with an integrated NOAA-NASA program office organization, staffed with personnel from NOAA and NASA, and supported by industry contractors. The program is co-located at NASA’s Goddard Space Flight Center in Greenbelt, Md. GOES-R is expected to launch in late 2015.